It was a night of many memorable performances and moments – here is a selection of some of them. 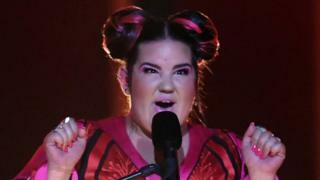 Israel’s Netta Barzilai was greeted with her prize by last year’s winner Salvador Sobral, who handed the glass microphone over with a smile – despite having previously said the song was “horrible”. As were her many fans – she stormed the final vote at the last minute. Hot favourite Eleni Foureira, singing for Cyprus, ended up in second place. Austria’s Cesar Sampson came a very respectable third place, drawing comparisons with Rag’n’Bone Man. SuRie was widely praised for her calm handling of a stage invader in the middle of her performance. The man was arrested and held in custody by police. If ever there’s a night to wear an outrageously huge dress, this is it. Estonia’s Elina Nechayeva was happy to oblige. Lithuania’s Ieva Zasimauskaite competed in Eurovision as part of the junior song contest when she was 14, returning aged 24. A very perky Benjamin Ingrosso sang for Sweden this year, but despite some solid scores he ended up in seventh place out of the 26 acts. The Netherlands’ Waylon was a crowd-pleaser with Outlaw in ‘Em. Claudia Pascoal performed O Jardim for Portugal, but after the country’s victorious performance last year, she came bottom of the leaderboard – with just 39 points.